Spy In Your Eye is a Eurospy production from the mid sixties. In France, police find a murdered man. It is the third body they have found in the last month with an eyeball removed. Creepy. After the titles, we cut to East Germany and to the Berlin Wall. Two people are trying to cross over, but their attempt is unsuccessful. The man is shot and the girl is captured. The movie then moves forward to a briefing that Colonel Lancaster (Dana Andrews) is presenting to his best agent, Bert Morris (Brett Halsey). Morris’ mission is simple. He has to go to East Germany and bring back Paula Krauss (Anna Maria Pierangeli). Krauss is the daughter of a prominent atomic scientist who died a few months previously. All parties, East and West, believe she may hold the key to some valuable research. After the briefing, Colonel Lancaster has an appointment at the Clinique Opthalmolique of Professor Van Dongen. You see (no pun intended), Lancaster is missing an eye and has been wearing an eye patch. At Van Dongen’s clinic he is going to be fitted with a new glass eye. But this is no ordinary glass eye. This is cutting edge stuff. The eye is actually connected to the muscles in the eye socket, so it moves just like a real eye. Lancaster is pretty happy with the procedure. But there’s more to it than that. Von Dongen is working for the Russians, and a tiny camera has been planted into the new glass eye. Now everything that Lancaster sees is transmitted back to the Russians. Meanwhile Agent Morris parachutes into East Germany where a hunchback is waiting for him. They ascertain that the Russian’s are taking Paula back to Moscow by train and organise a daring rescue mission. The rescue is successful, but the next problem is getting back across the frontier. The border is protected by a field of land-mines. Morris and Krauss make the crossing with the aid of a bulldozer. 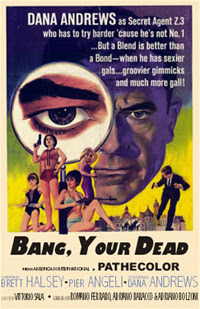 Spy In Your Eye is a fairly enjoyable Eurospy production, and features some memorable set-pieces. It’s main weakness is the lack of a decent villain. A common failing in many Eurospy productions is an underwritten and under utilised villain. They seem to have figured that a suave spy clobbering or evading hordes of henchmen was enough to keep the plot moving. Spy In Your Eye falls into the same trap. The villains are a generic bunch of Russians – all black leather coated thugs. Their leader, and I use the word loosely, is ‘Boris’ (Gastone Moschin). In any other spy film, ‘Boris’ would be ‘second thug on the left’, not the leader. As a threat and a worthy opponent, ‘Boris’ just doesn’t make the grade. Despite it’s weaknesses, Spy In Your Eye is a decent example of the Eurospy genre, and worth seeking out. For those wanting to track down a copy, I notice that The Eurospy Guide suggests it may be hard to track down an English language version. The good news is that Sinister Cinema have an English language version, which appears to be an old American television print – the image is clear but a touch on the brown side (still very watchable).